ADD AN AIR TUBE TO YOUR DRUMS. It's a simple little addition to your kit but it can make a big difference in your sound. Chuck didn't invent this, but he wanted one.To make your own just follow the instructions below. "People have seen me perform with THE AIR TUBE for years and invariably someone asks me, "How do you do it"? and "Where can I get one"?. It gets people's attention! One drummer hung around after the gig for half and hour just to ask about it." HOW DOES THE AIR TUBE WORK? With THE AIR TUBE installed, you simply blow air into the tube to change the pitch of your tom. You'll be creating new and unique sounds instantly. This is a close-up of the mouthpiece. The construction is quarter inch medical tubing with a patented threaded shell mount sleeve. The tubing can be either clear or tinted. One end is attached to the tom the other end has the mouthpiece. Here is a close-up of connection for the tom. It fits in any drum that has a quarter inch air-port and two drumheads. You just remove one drumhead on your tenor tom. You mount THE AIR TUBE inside the drum's air-port then put your drumhead back on and it's ready to go. Complete instructions are on the package. It will take you about ten minutes to install it. YOU CAN GET AN AIRTUBE FROM CHUCK? Chuck's AIR TUBE KIT comes ready to go. The only thing you have to do is attach it to your kit using the instructions that come in the package. Also please remember to rinse it out periodically. 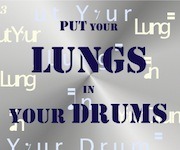 It is designed to push breath into the drum and when you release the air will escape. It's just a health precaution to keep the tube and the mouthpiece as clean as possible. If you'd like to have the kit email chuck@chuckstandish.com. The price: $20 ~ Shipping is on us in the US. Here is a series of close-ups that might help with the installation. Every kit is different but this will help you visualize the process. This close-up is pretty self-explanatory. A tom without the tube installed. You can plainly see where the tom-end of THE AIR TUBE goes. Here is the AIR TUBE installed. Be sure the quarter inch nut is securely tightened so it will sit well and be secure. Here's a visual looking inside the drum . You can see the gray rubber grommet connected to the sleeve after it has been attached. Here's a view of THE AIR TUBE correctly installed and looking great!